(Click on thumbnail for enlargement) The London police force clearly has the graphic-design edge , but the Chicago Police Department matches if not outshines the British bobbies for the ardor and toxic nuttiness with which it propagates anti-terrorist paranoia. Click on the image to read which categories of people are considered suspects now. You might want to duct-tape your jaw to your face first (be careful not to do this in public; I'm sure the cops consider duct tape highly fishy too). Like the London example, this flyer is genuine. You can find it on the City of Chicago's website here. 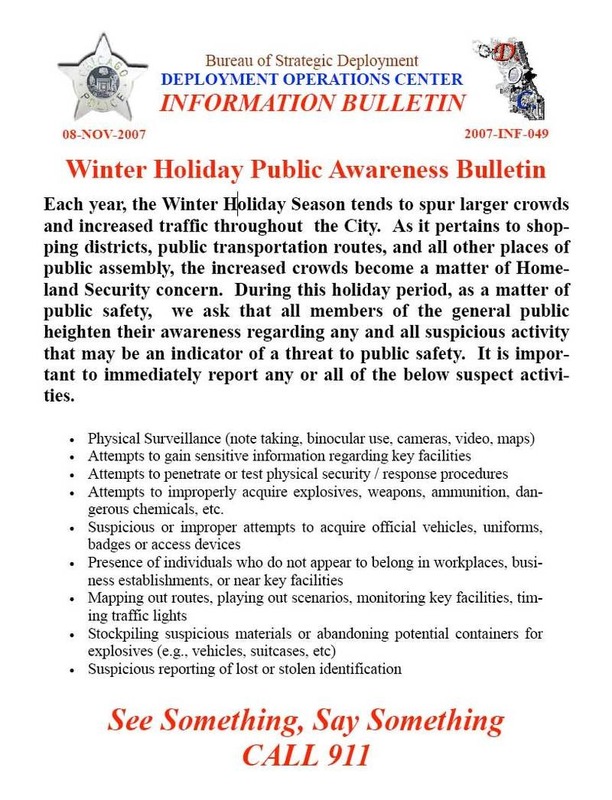 If terrorists do their dirty work by spreading, well, terror, what should we call public servants who aggressively promote fear and unhinged suspicions by telling the public to report note takers, binoculars users, camera enthusiasts, map owners, and motorists who time traffic lights?